The Women's March in Pittsburgh heads down Grant Street on Saturday, Jan. 19, 2019. A Women's March participant holds a sign outside of the City-County Building downtown while rallying on Saturday, Jan. 19, 2019. A baby Trump balloon flies away. Some carried signs saying things like "my body, my choice," "340 mass shootings is a national emergency," and "let's talk about the elephant in the womb." While many joined the event and subsequent march to Market Square, this year's gathering was noticeably smaller than years past. That may have had something to do with the low temperatures and possibility of snow. The Women's March opened with the singing of "Lift Every Voice and Sing." Carolyn Morrison, 48, of Rankin went to the march to rally behind the issues of better jobs and more equitable pay for women. "Stuff ain't getting better because [Donald Trump's] in office," she said. "It's so sad." Larry Debar, 34, of Castle Shannon was there to stand in solidarity with the women in his life, who he says deserve greater equality. "I like to see large groups of people assembling in the streets because people are powerful," he said. Speakers at the event included candidates running for city and county councils, district attorney, County Court of Common Pleas judge, and state Senate. Since its inaugural event in 2017, The Women’s March on D.C. and its affiliate marches across the country have advocated for voting more women into office. The Pittsburgh march emphasizes the importance of participating in local elections, canvassing for political campaigns and volunteering. CMU students Ananya Bhat and Victoria Patella. “This is my first Women's March. I’ve always wanted to go ... we should use our voice in any way that we can. I’m part of the LGBTQ community, and speaking up for that is really important," said Patella. State Rep. Summer Lee, a progressive liberal who made headlines for ousting longtime Rep. Paul Costa, emphasized the importance of supporting candidates who are women of color. "You can't say you support black women and not support black women candidates," said Lee. Tracy Baton has directed all three local marches in Pittsburgh. She said the needle has clearly moved since 2017. “There are so many more people in the street registering [others] to vote, knocking on doors, canvassing,” said Baton. 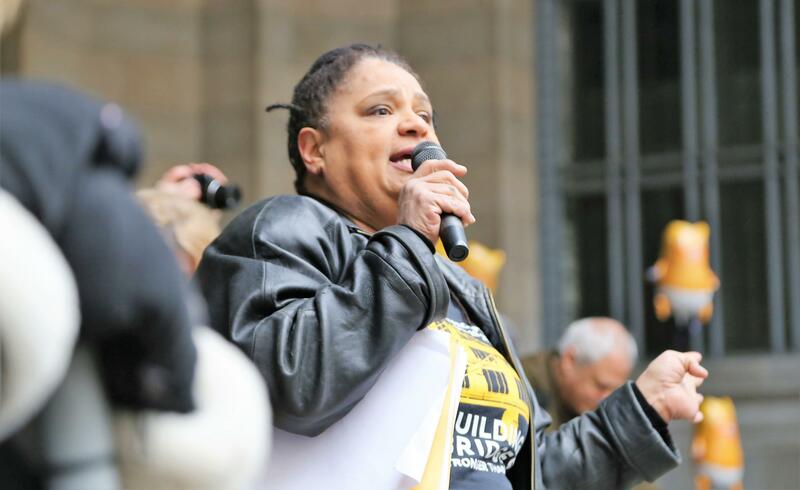 She also pointed to the grassroots support of candidates like Lindsey Williams, the Democrat who won a seat in the Pennsylvania Senate in 2018 by less than a percentage point. But Baton acknowledges that building consensus across the movement is still an evolving process. Attendees marched four blocks from the City-County Building to Market Square Saturday, where other speakers addressed a range of topics. Issues of racial justice, environmental justice, immigration, and food security were highlighted by attendees. This year there was also a larger emphasis on gun violence. Michelle Kenny, the mother of Antwon Rose, spoke. Rose was fatally shot by East Pittsburgh police in 2018. Moms Demand Action Against Gun Violence was a partner organization. Noelle DiSilvio, 18, of Squirrel Hill was among those at the march concerned with gun violence and gun control. She was there "So I don't have to be scared at school, at the movie theater, or in places like this," she said. Other speakers included local students and activists, and leaders of the organizations Casa San Jose and Trans YOUniting. 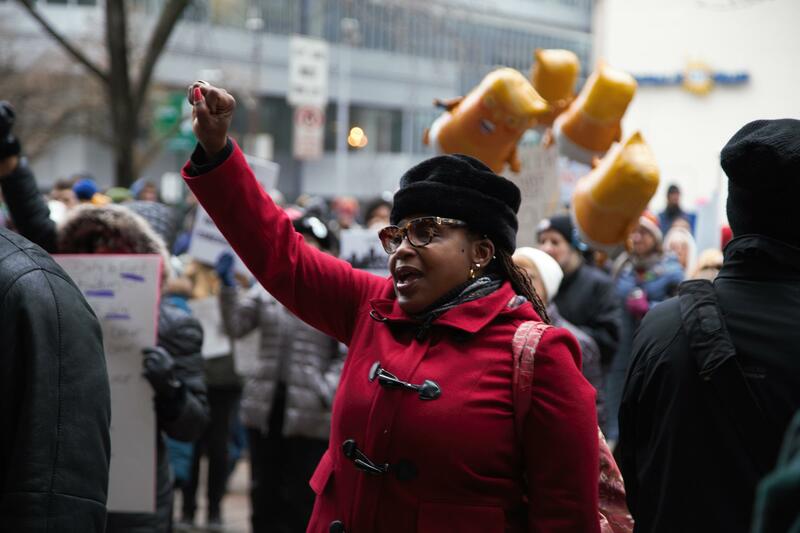 Tracy Baton, one of the organizers of the Women's March in Pittsburgh, speaks to the crowd on Saturday, Jan. 19, 2019. Division among feminists across Women's March groups around the country has been documented since the event’s inception. Concerns have been expressed that marches are intended only for white feminists. In Pittsburgh, some have claimed a lack of trans advocacy, and intersectionality. As a result of critiques in 2017, Baton, a queer black woman, took over leadership of the Women's March. A second march dubbed "Our Feminism Must Be Intersectional" was held in East Liberty that year, organized by critics of the Women's March. Baton said the Pittsburgh march has always centered women of color. A fundraiser to bring a giant balloon depicting Trump as a baby to this year's march in Pittsburgh also caused a bit of backlash. While efforts to bring the balloon here were ultimately scrapped, smaller Mylar versions of the balloon were prominent Saturday. Accusations of anti-Semitism have roiled the March's national leadership. “Our Jewish sisters have already been part of the work,” said Baton ahead of this year’s Pittsburgh march. She said the local Women’s March organization supported Bend The Arc when the group protested President Donald Trump’s visit after the shooting at the Tree of Life Synagogue. "I am a white woman here to oppose white supremacy," said Sarah Stock Mayo, who identifies as a progressive Zionist. "To all the women of color who may not agree with all the tactics of this movement, help us do better. We are trying to build new worlds and it is a messy process." 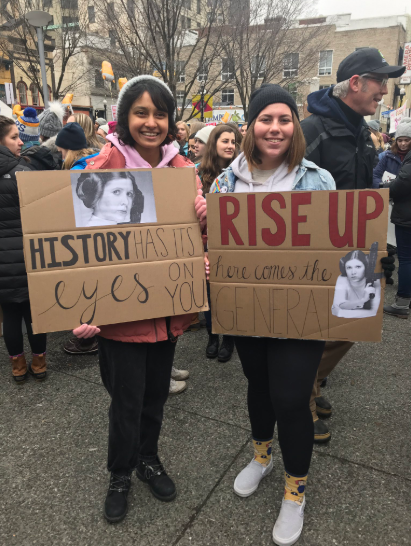 Jessie Ramey, director of the Women's Institue at Chatham University, said centering women of color is crucial inside and outside of the marches. "We need to follow our sisters of color," said Ramey. "We do not need to start a new organization to get the work done. We need to show up and support the great work that is already happneing ... One rally is not the work. The work is what we do the rest of the year." Monica Ruiz, executive director of Casa San Jose, urged people to not just talk about change, but act on it. "It's been a year since we all stood here and made some promises, and I came to ask you, what have you done?" Ruiz asked the crowd. "Have you volunteered? Have you donated money? Have you had that conversation with your racist uncle at Thanksgiving? Have you reached out to someone different than you? ... Next year I will ask you again, what have you done?" 90.5 WESA reporter Sarah Kovash contributed to this report. *This post was updated at 3:43 p.m. to include more information. The opportunities for playing – and hearing – live music Downtown are expanding. The Pittsburgh Downtown Community Development Corporation announced Wednesday that nine venues will add music or expand existing offerings. Proper classroom accommodations for students on the autism spectrum can be hard to come by. One local group hopes to provide better access to environments where students have the best chance at a good education.